Get the best views of the city as you bask in the beauty of Clear Lake, Kemah and Galveston Bay during our Boardwalk FantaSea Leisure Cruise! Alocholic and Non-Alcoholic drinks available for purchase. Audio guided tour and a variety of music for your enjoyment. Tickets have gone offsale, or are not yet available for this date. * Gratuity, sales tax and port charges are additional. You will have an opportunity to review your order and add enhancements in the steps that follow. There's always something going on at the Boardwalk FantaSea! See the latest promotions and offers! © 2012, Boardwalk FantaSea ? #8 Kemah Boardwalk Suite G Kemah, TX. 77565. 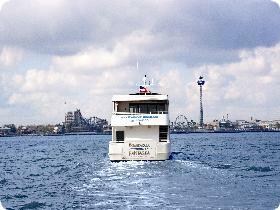 Boardwalk FantaSea Yacht Charters is wholly owned by Landry's Inc.